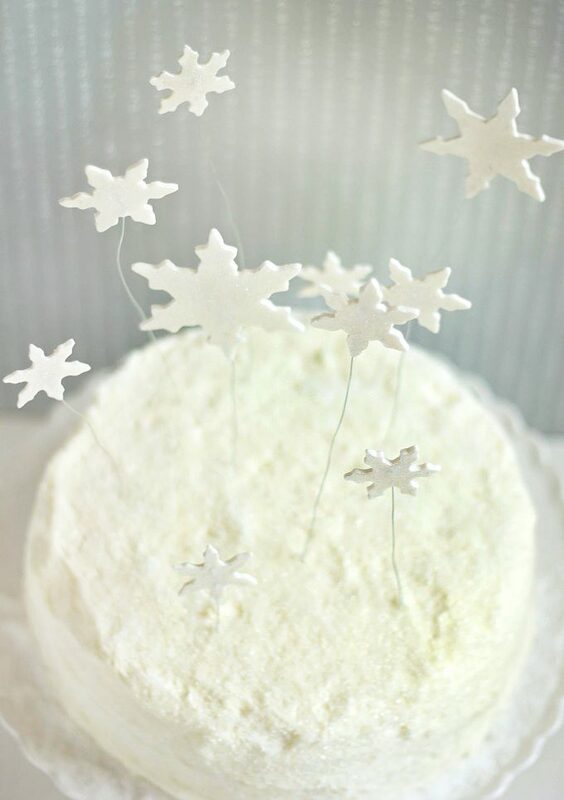 Home » Recipes » Dessert Recipes » Cakes » I’m Dreaming of A White Christmas Cake ! One of my all-time favorite winter season cakes is this amazing White Christmas Cake. It's perfect for your holiday get-togethers or to make your holidays extra special. 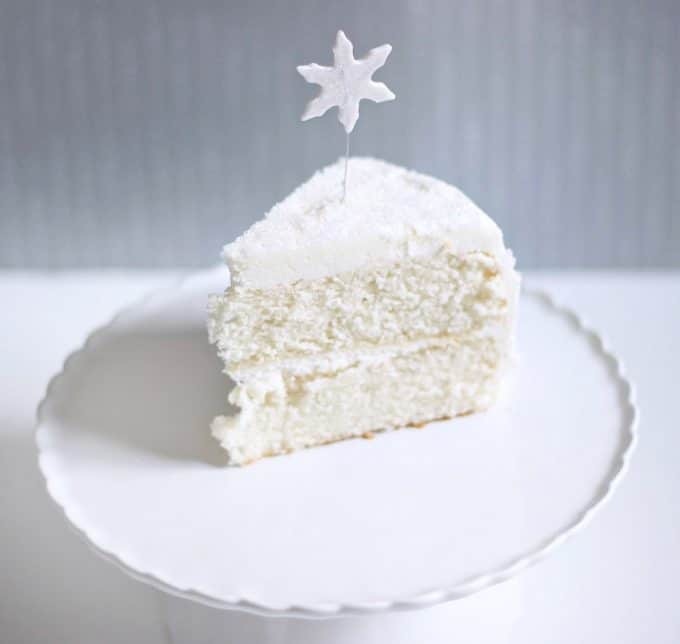 Enjoy this delicious White Christmas Cake that my friend Nicole has shared with us. With the holidays in full swing, I knew I had to make something seasonal for y’all. I spent much of my life in the South, and now live in Los Angeles, so I have never woken up to a White Christmas (even when we lived in upstate New York for two years, we spent Christmas down South). What a sad life, I know. I mean, seriously, what’s Christmas without snow? I blame this attitude entirely on Home Alone and pretty much every other Christmas movie ever made. Can you imagine It’s a Wonderful Life without snow? That’s what I thought. Anyway, I figured that since I won’t be having a White Christmas this year, I needed to make my own winter wonderland. That’s how I came up with the idea for this cake. The cake I chose to make is a fluffy vanilla cake. It’s a delicate white cake with the perfect crumb, and it is oh-so-fluffy. 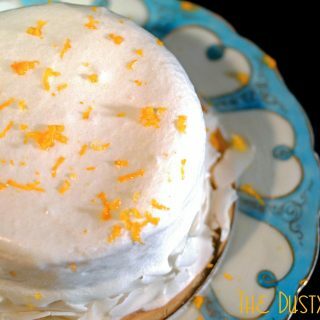 The frosting is a whipped vanilla frosting that is super light and airy, just like snow. It is the best vanilla cake I’ve ever had. Did you hear me? The best! In hopes of making the cake look like a true winter wonderland, I topped the entire cake with white sanding sugar for a glistening snow effect. Then, I made some shimmery gum paste snowflakes that I placed on floral wire to give the illusion of falling snow. I have to say, I love the results! My husband did, too (only he’s complaining about starting to gain those Christmas pounds early). Whether you’re looking for a beautiful holiday dessert or just dreaming of a White Christmas, try making this cake to share with your family and friends. And feel free to make it your own! Add a cute little snowman, a flocked evergreen or some red and green frosting around the base. After all, it’s your Christmas! Thank you all for reading! And thank you again to Chef Dennis for letting me share this cake with you! Happy Holidays, everyone! If you’re looking for more deliciousness to serve your friends and family you might also enjoy these holiday favorites. Preheat oven to 350 degrees F. Grease two round 8-inch cake pans. Place round pieces of parchment paper in the bottom of each cake pan and grease the parchment paper. Flour the bottom and sides of the cake pans by tapping a spoonful of flour around to coat. Discard any remaining flour. In a measuring cup, whisk together the egg whites, 1/4 cup of milk, and the vanilla. Set aside. In the bowl of a stand mixer fitted with the paddle attachment, combine the dry ingredients on low speed for 30 seconds. Add in the butter and the remaining 1/2 cup of milk. Mix on low speed just until moistened. Increase the speed to medium and mix for 1 1/2 minutes. Scrape down the sides of the bowl. With the mixer on medium speed, add the egg mixture in 3 batches, beating for 20 seconds after each addition. Divide the batter evenly into the cake pans using an offset spatula to level the batter. You can weigh the cake pans on a kitchen scale to ensure even layers. Bake for 20-30 minutes or until a toothpick inserted into the center comes out clean. Be very careful not to over bake! Let cool in pans for 10 minutes. Loosen the sides of the cakes with a small knife or spatula and invert cakes onto greased wire racks. Gently re-flip the cakes so that the top of the cakes are facing up. Let cakes cool completely. Wrap the cakes tightly until they are ready to be frosted. 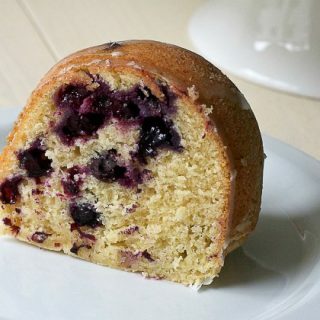 The cakes can be stored at room temperature for 2 days and in the refrigerator for 5 days. In the bowl of a stand mixer fitted with the whisk attachment, whip the butter on medium speed until pale and creamy, about 8 minutes. With the mixer on low, add in the remaining ingredients and mix for 1 minute. Increase the speed to medium and whip until frosting is very light and fluffy, about 6 minutes. Roll out gum paste to about ⅛” thickness. Cut out snowflakes of different sizes. Cut floral wire into varying lengths. Very carefully insert floral wire into the snowflakes, making sure to insert far enough to provide support to the snowflake. Let snowflakes rest to dry out. Best if done at least the day or night before using. Place the bottom cake layer bottom/flat side down on a cake stand (or any dish that you will be serving it on). Place about 1 cup of frosting on the top and spread it evenly with an offset spatula. Gently place the 2nd cake layer top/rounded side down on top. Place a small amount of frosting on top of the cake and create a crumb coat by spreading the frosting thinly over the top and sides with a small offset spatula. Place in the refrigerator and chill for about 30 minutes. Remove the cake from the refrigerator. Place remaining frosting on top of the cake and spread it evenly over the top and sides. You can make the frosting textured to look like freshly fallen snow, as I did, or make it smooth. Pour sanding sugar all over the top of the cake. Carefully tilt the cake slightly to pour sanding sugar on the sides. Rotate the cake and repeat until all sides are coated in sanding sugar. Place the cake back in the refrigerator and chill for about 30 minutes. Remove the cake from the refrigerator. Carefully insert snowflakes into the cake. Make sure to vary the heights so that it really looks like falling snow. Enjoy your beautiful White Christmas Cake! Really nice dream. Really awsome. This is just absolutely stunning! Perfect for Christmas! I started having this problem with a couple of my cakes in the past. What I found was my oven not preheating properly. Now I use an oven thermometer to make sure it is truly up to temp. Haven’t had the problem since…. Thanks to Sweet Peony for sharing this wonderful recipe with us. I will bake this cake tomorrow for a birthday and the birth day girl asked me if I could make a christmas themed cake but when I asked her if she had anything in mind she told me that she prefers almond flavored cakes. So the question is: Can I substitute the vanilla extract for pure almond extract in the batter? I will keep the frosting vanilla flavored. I was wondering if this could be done without compromising the flavor of the cake and the icing. THANK YOU! I made the cake for Christmas! it looks MAGICAL! you gave easy to follow instructions and I can not wait till my grandchildren see it! You’re very welcome Joan, I’m sure your Grandchildren are going to love your cake! I am so excited to make this for Christmas dinner this year – absolutely beautiful! The snowflakes call for “clear alcohol or extract.” I should probably know what this means, but I’m not really sure what to use. Can you explain this ingredient? Thank you! It turned out perfectly and everyone loved it. I made this cake last year when I first came upon it. It is quite possibly the most magical tasting cake I have ever made. It made our mouths sing “Hallelujah”. It has been my go to white cake ever since and when I am asked for the recipe, I really don’t want to share it. LOL…. but I do because how can I hold on to this tongue happy deliciousness. the ingredient amount should be as written, i.e 1 tablespoon plus 1 teaspoon. That means both of the amounts should be used when called for, nothing should be held back for later or as needed. This was a guest post by a friend of mine and that’s just how she wrote the ingredients out. Good luck with the cake, I’ve gotten rave reviews from people that have made it. I made this yesterday to take to a friends party and it turned out great although I just used a plain buttercream frosting with a few crushed up fruit tingles in it turned out fab, I didn’t sift any flour either and still turned out great nice light and airy was yum! Thanks for a great recipe. Hi. By any chance, have you weighed your flour? I like to have precise measurements if at all possible. Do you sift a bunch of cake flour first and then spoon that into a measuring cup and level it off to get the right amount? Thanks! no the flour wasn’t weighed, sorry. It was sifted first, then spooned into the measuring cup and leveled off. This was a guest post on my blog, but I did make it for myself and followed the instructions and it came out really well. Thanks for your reply. Finished the second one, and it did taste the same, it was just slightly denser. On the frosting, I probably had let the butter set out on the counter a little long to the point where it was not cold. Going to try that again and let it whip longer both times. My husband has been sampling the cake and LOVES it! It is a very moist, light cake! I’m actually making this for a baby shower (w/o the snow), so I’m sure they are going to love it. Thanks again! Hi, I tried making this cake and I have a couple of questions. What consistency should the batter have? At first it was very liquidy, but the cake turned out great! 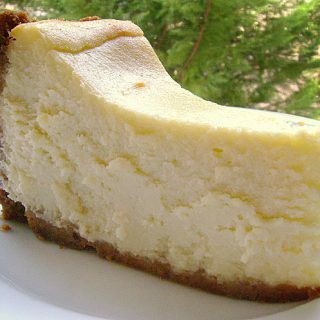 On my last batch, I accidentally added all of the milk with the egg whites, and therefore had to start adding a little bit of the egg mixture while mixing the butter. That batter turned out thicker, much like a cake mix. I haven’t tried it yet to see how it turned out. So what should the consistency be? Also, on the frosting, mine turned out looking a little more liquid like and less whipped looking from the picture. Any ideas on what I did wrong? 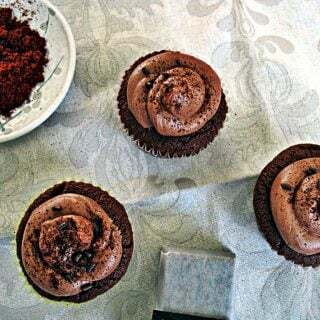 I am interested to see how the second version of the cake turned out, my only thoughts are that when you changed the order of adding ingredients that it emulsified the batter making it look thicker. I honestly don’t think it would affect taste, just possibly the texture. As for the frosting if the butter was too warm it may have made it look less whipped, while it does need to be softened it still needs to be as cold as possible. The change in temp would effect it. Did you let the butter whip long enough as well as the finished frosting at a high enough speed? Wow absolutely beautiful and so Christmas! Gorgeous! Gorgeous! Truly like a winter wonderland… I love Sweet Peony’s sweet recipes. She’s great! Thanks for featuring Nicole, Chef Dennis! I love a white cake that is actually white, this one is perfect! We had a cake at my father-in-law’s b-day party last weekend with whipped frosting. It was so good and I was wondering how to make whipped frosting. Now I know. Thanks! Its like a winter wonderland! Beautiful cake! That looks fantastic and is so festive. What an absolutely beautiful cake! It looks dreamy and so festively befitting 🙂 Thanks Chef for introducing Nicole. Congrats on the Top 9 today! That’s a beautiful and delicious looking cake! This looks dreamy! Congrats on Top 9 – I’m happy to be listed with you! Merry Christmas! 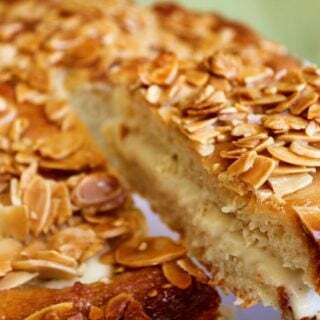 This cake look so beautiful and tasty…I enjoyed this guest post..Congrats to both of you on Fbuzz top 9!!! Wow, I knew I had to make this the moment I saw the photo. There’s something about all white desserts that just makes me crazy, it’s beautiful! Beautiful cake!!! I love it. Beautiful guest post! While I hate the snow, I agree, it is strange to have Christmas without it. The cake looks wonderful! 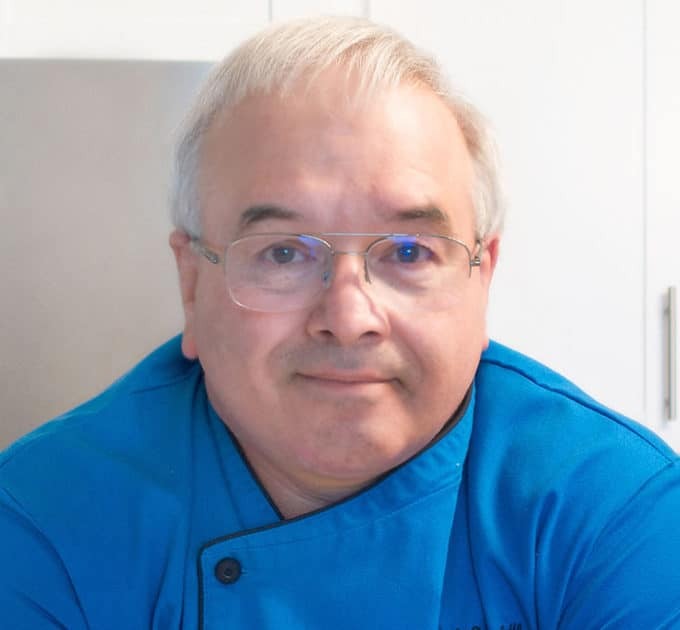 Hope you are well and enjoying the lead up to the holidays Chef Dennis. I am so in awe of this white cake. It’s just so pretty. Congrats on top 9 you two. Heading over to Nicole’s now to say hello. This cake is simply gorgeous! I love the gum paste snowflakes!! This is just so pretty – I fell in love with it when I saw the first photograph! Wow this is one gorgeous cake! I love the snowflake decorations, the frosting truely does look like snow. I bet it tastes absolutely amazing! Hi everyone! Thank you so, so much for all of your sweet comments! I’m so happy that you enjoy the cake! 🙂 Thanks again, Chef Dennis! Nicole-This cake is just stunning, and I love shimmering snow on top of the cake. Here in Illinois this year, we might not have a white Christmas, but at least I can make your cake and have a White Christmas! Chef-Can’t wait to see the gingerbread creation! Wow, that is one pretty cake! 🙂 I don’t think I’ve ever had peony flavored anything, other than tea. Very nice! This cake is absolutely beautiful, a picturesque winter wonderland in edible form. I bet it’s delicious too! What a stunning cake! I especially love the delicate snow flakes. I’m definitely suffering from baker’s envy here! YUM! Absolutely Beautiful. Wonderful guest post Chef Dennis and thanks for sharing this lovely cake with us Nicole. Happy Holidays to you both. Hello Chef & Nicole! Such a treat to see your work here Nicole…I’ve viewed some spectacular posts on your blog and Facebook, but this cake is gorgeous, beautifully photographed and decidedly festive. Brava! Chef, please post pics of the Gingerbread House. What a gorgeous cake & beautiful post for Christmas! Thanks for sharing, Sweet Peony! Happy Holidays, Chef Dennis! It’s been a great year…wish you the best for 2012! 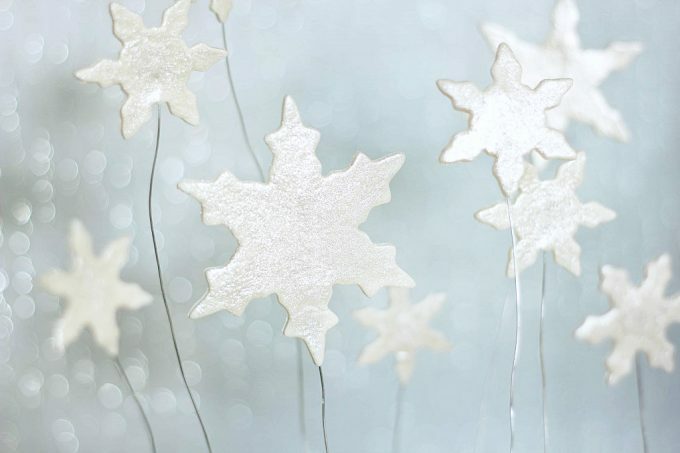 What an awesome idea to decorate with the snowflakes like that. They are so perfectly lovely. I am never EVER that creative or even inclined to decorate my baked goods, but you are tempting me to try. This is truly a white Christmas cake! WOW. Stunning cake and photos, Nicole!!! Just beautiful. Great to see Nicole guest posting for you Chef. She does have a wonderful blog and I have already saved several of her delicious recipes. 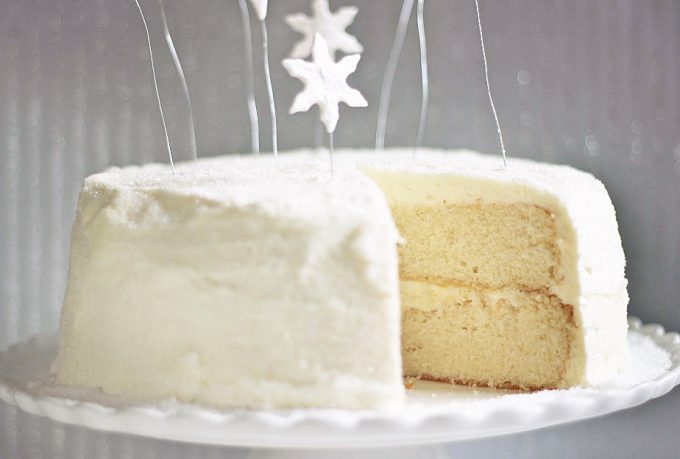 White cake is a tough one when it comes to achieving the right texture, color and taste. 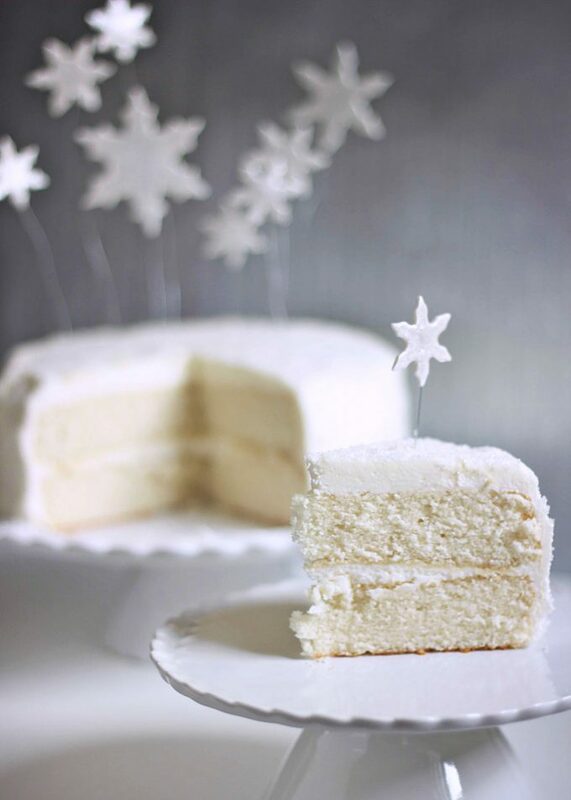 This cake is an amazing pristine white and the snowflakes are a lovely touch. One advantage to being in LA , you can have this winter wonderland of a cake while the snow bound people are shoveling snow! Chef-I am looking forward to seeing the gingerbread house. I can remember as a kid watching my mom make one, while all the time she had this stern look of “you better not touch”. Enjoy this wonderful holiday season! 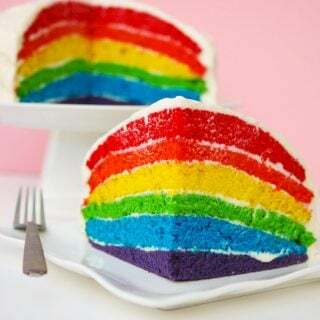 That is such a beautiful cake. I’ve never had a white cake actually turn out white. Like Chef Dennis, I think my luck is about to change. I’ve never had a white Christmas either. Its both the blessing and the curse of living in Southern CA. Hi Chef Dennis & Sweet Peony! What a beautiful, timely post! The cake is absolutely stunning and it looks just like Christmas! Beautifully done and congratulations! Wow! This cake is gorgeous. Wonderful job! What an amazing cake! Picture perfect for those of us without snow this Christmas! Stunning cake & great post!